Looking for a small monkey had Dustin Hoffman willing to break a number of rules to develop the antidote for a deadly virus in Outbreak. Sometimes we may feel like unlocking the key to leadership in the church in an era of what Alan Roxburgh refers to as discontinuous change like finding a lone monkey in a forest. If we could catch the little rascal we may well be able to find the antibodies, and so the antidote, to a form of leadership that may well have inoculated us against leadership qualities most helpful in carrying on the mission of Jesus in the world. Dave goes on to describe forms/qualities of popular forms of church leadership that may well need to die. He concludes leaders in the missional church/turn will need to recognize those antibodies leading to a resistance to change. My doctoral work was on leadership in the small church. I identified four qualities that inhibited adaptability – resistance to change, fear of outsiders, lack of cohesive/coherent organization and lack of unified forward movement. Resistance to change seems to be a given in a time of discontinuous change. I always marvel at our willingness to build new homes, buy new cars and dabble with the latest technologies but when it comes to church we cannot possibly consider change a possibility. Of course, the problems we face will not be solved merely by suggesting that pastors embrace a new paradigm of leadership. Current leadership models are dictated in large measure by the cultural expectations of Western churches and by the theological training provided by seminaries and bible colleges. In both churches and seminiaries there are plenty of “antibodies” ready to suppress any outbreak of the missional virus! Unless climate changes, missionally-inclined leaders will increasinly choose to work outside the system. One element I would comment on in reference to Dunbar’s reference to cultural expectation that affect leadership is our affinity for celebrities. Success by our heroes constitutes deification of their leadership style. These models become goals ignoring local context and atmosphere. Despite Rick Warren’s early pleas many an attendee at his “Purpose Driven” seminars took his leadership style thinking they were returning to a comparable. Many a young leader lost his way having little concept of local context and atmosphere, much less incarnational leadership. 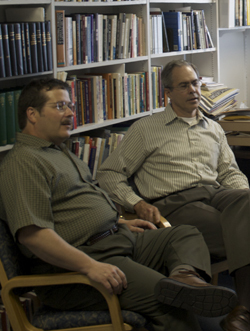 Listening to Lance interview Dave and Todd a couple of weeks ago, it was good to hear Dave describe the hopes of Biblical Seminary. The goal to mentor leaders who would be aware of the antibodies to missional leadership and prepare young leaders for our current climate of discontinuous change may well give us hope for the future of leadership in our churches.